Virtually every experience we have on the water is a learning experience. Two weekends ago was no exception. My friend, Joan, was in town from Chicago so decided we'd take her sailing for the weekend. 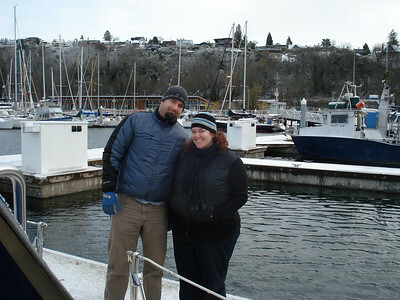 We had been planning for awhile to go sail for a weekend with Aaron and Nicole from s/v Bella Star. Since Aaron took apart Bella Star's windlass and is having some difficulty getting it back together, we decided a marina was the better answer. So we picked Kingston as the destination. Saturday morning, we checked the weather forecast and they all seemed to agree on around 15 knots of wind coming out of the north. And, of course, Kingston is north. 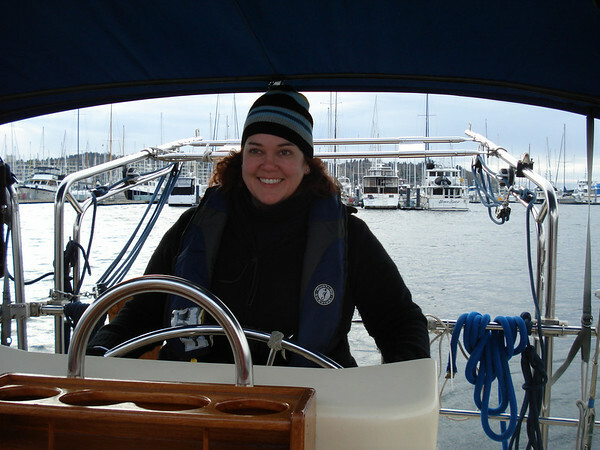 No worries, we'll have a brisk sail to weather and then nestle into the marina and enjoy some hot toddies and a good dinner. If you've been reading this blog for any length of time, you'll have accurately predicted by now that our plans have very little to do with what actually happens. Christy was driving as we pulled out of Shilshole marina. I was on the bow cleaning up the docklines when we turned the corner around the south end of the breakwater. Our predicted 15 knots from the north, was actually a solid 25 knots gusting to 30 knots. They did get the direction right though - thanks NOAA. Along with the wind came 4 to 6 foot seas. Which meant me out on the foredeck moving up and down through about 10 feet of space every few seconds with a healthy dose of greenwater shipped over the bow every now and again. Ya know, for fun. I got off the foredeck sharpish and back to the cockpit. Since we've never had her out in weather like this, we decided we'd go conservative and set a deeply reefed main along with the staysail. It turned out to be too conservative as we couldn't make enough speed against the seas to be able to tack the boat. And since our cat, Shithead, was cowering belowdecks convinced that the very universe was coming to an end, we decided against pulling out some of the jib to make a little more velocity. We turned the motor on and motor sailed at about 35° off the wind and bashed for an hour or so. The longer we bashed into the wind, the greener we all became. Suddenly, that big breakfast of sour cream pancakes this morning and steins of beer the night prior started to look like a tactical error. We have a past history of mal de mar and it reared it's ugly head once again this day. Mostly, all over the fender covers and cockpit. One of the things I'm learning about myself: I'm a boot and rally barfer. As soon as I throw up, I'm good to go. Refreshed and raring to get back at it, albeit with really bad breath. One of the things I learned about Joan - she's not. And one of the things I learned about Christy - she has an innate ability to suppress vomit. She looked rough the whole time out but even after hanging over the rail for a good 15 minutes, nary a drop of bile escaped her lips. So we made the call to turn the boat around. Kingston would have to wait for another day. As soon as we got her turned around and pointed south, the world immediately settled down and we all became a little happier. The wind gave us a nice shove along with some lovely swells from the stern. So - what did we learn this weekend? A time machine is the only accurate weather forecasting tool. Don't rely on the forecast being accurate! Get your PFD on before you leave the dock because there's too much business to attend to once the boat is in motion. Being on the foredeck in four to six foot seas sans PFD isn't a great idea. 25 knots is not enough wind to go under reefed main and staysail on our boat. If you're prone to sea sickness, don't play with your iPhone. Christy and I have a veto rule. If one of us is ever uncomfortable in a situation, that person has the right to veto our way out of that situation. Period. We both played the veto card during this trip in different situations and it worked great. After the boat is safely in port and everything calms down, we like to talk about what happened. This goes for trips that go smashingly well and trips that don't. This also worked great and is always a good learning tool for us. Joan driving us out of Shilshole the second time after we decided to duck back into the marina and rig the staysail rather than rig it in the swell. Solid ground - woohoo! Sort of. i totally disagree with avoiding the foredeck in high seas! partypoopers! It's not the foredeck in high seas that's a problem. It's the foredeck in high seas sans PFD that wasn't terribly smart. Xlnt post, with xlnt conclusions, you 2. But don't assume just yet that your boat can't sail well through the conditions you had - it's not the wind, it's the water. Sometimes it's just impossible to sail through a steep chop w/ pyramid-shaped waves unless you're on a broad reach or DDW. Hey Marianne! Thanks for stopping by - I really appreciate the feedback! You're right, we had a hard time punching through the chop for sure. I'd like to see how our boat does in those conditions with a smidgen of jib, staysail and reefed main. We could pull out more of our main and still balance the boat if we had some sail farther forward than the staysail. Our staysail is more of a storm hanky than anything else.